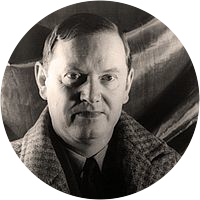 A collection of the best Evelyn Waugh quotations. Words should be an intense pleasure just as leather should be to a shoemaker. The great charm in argument is really finding one's own opinions, not other people's. Cliché hunting is a cruel and mischievous hobby—the badger digging of the literary blood sports. One forgets words as one forgets names. One's vocabulary needs constant fertilizing or it will die. Style is not a seductive decoration added to a functional structure; it is of the essence of a work of art. The most futile and disastrous day seems well spent when it is reviewed through the blue, fragrant smoke of a Havana Cigar. I never can understand how two men can write a book together, to me that's like three people getting together to have a baby. Properly understood, style is not a seductive decoration added to a functional structure; it is of the essence of a work of art. One has to regard a man as a Master who can produce on average three uniquely brilliant and entirely original similes to every page. To see him fumbling with our rich and delicate language is to experience all the horror of seeing a Sèvres vase in the hands of a chimpanzee. An artist must be a reactionary. He has to stand out against the tenor of his age and not go flopping along; he must offer some little opposition. I am not the least worried about the charge of using clichés. I think to be oversensitive about cliches is like being oversensitive about table manners. In the dying world I come from, quotation is a national vice. No one would think of making an after-dinner speech without the help of poetry. It used to be classics, now it's lyric verse. In the dying world I come from a quotation is a national vice. No one would think of making an after-dinner speech without the help of poetry. It used to be the classics, now it's lyric verse. Novel-writing is a highly skilled and laborious trade. One does not just sit behind a screen jotting down other people's conversation. One has for one's raw material every single thing one has ever seen or heard or felt, and one has to go over that vast, smoldering rubbish-heap of experience, half stifled by fumes and dust, scraping and delving until one finds a few discarded valuables.